At some time or the other during our lives we observe the practices of dana and dakshina. 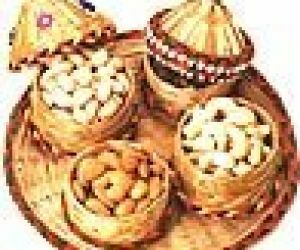 Dakshina:On any occasions like marriage, thread ceremony, opening ceremony, rites at death,Puja ,Kathas etc., we ask a Brahmin priest to officiate over the ceremony and in return for his services we offer him grain, cloth, gold or cash. Remember that you cannot perform a puja at someone elses cost (eg the cost of fuel, the payment for flowers,Pan etc etc ),you must be fully responsible for the cost of the puja you perform with Bhakti and Bhauna if you want to derive the full benefit of the puja or to attain the lotus feet of the lord.. (refer to the shree sath narayan vrat katha - the lakadhara story ) Even a Flower from someone elses yard without proper payment is not yours to offer to the lord , as you dont have any right over it. The same as the cost of the Brahmans to come to you and perform the rites on you behalf ,if not properly rewarded for his cost, one may not derive full benefit. Dakshina is given for a service provided by a priest without asking for it. The custom of dan and dakshina has always been part of Indian society and like Yagna, its origins seem to be in the collective hunting and common sharing way of life of life of the Vedic period.In determining the amount of dakshina to be offered to the priest, the yajman should take into account the time devoted by the priest to the performance of a particular ceremony and in reaching the venue of this service. Dan:is the traditional Indian form of charity. We are told that giving away of dan secures divine blessings for the giver. As such dana can be given to anybody but the emphasis has always been on giving dana to Brahmins. Hindu tradition has never extolled Dana to Kshatriyas, Vaishyas or Shudras. Dana is different from dakshina as it is given the a brahmin or Poor and needy totally as a donation only ,not in return of his service. Since ancient times kings and noblemen have organised mass feeding ceremonies, distribution of grain and utilities as dan. Such giving away of wealth without expecting anything in return except blessings, was termed Dan.